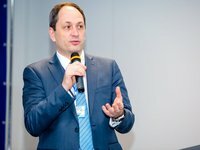 The so-called "peace plan" for Ukraine proposed by OSCE envoy to the Trilateral Contact Group (TCG) Martin Sajdik requires a number of decisions by the parliaments of Ukraine and other countries and is questionable, Ukraine's Minister for Temporarily Occupied Territories and Internally Displaced Persons Vadym Chernysh. "In fact, this is not the continuation of the Minsk agreements – these are additional agreements, which, among other things, require a number of decisions not only of the Ukrainian parliament, but also of other countries' parliaments, therefore they cannot be implemented in principle," Chernysh said at a press conference in Kyiv on Friday. According to him, this plan cannot be officially discussed either in terms of the procedure it describes or the content. Chernysh noted many points of the plan are questionable. "As for the mandate of this entire [OSCE-UN] mission, which is proposed in this document, let me draw your attention: it covers the whole territory of Donetsk and Luhansk regions, including that controlled by the Ukrainian government, but there is a minor provision saying that the civilian component is only for the occupied area, while the entire mission also covers the government-controlled territory, which is weird. I cannot comprehend the logic in this case, and this has not been stipulated in any agreements that Ukraine has signed or approved until this moment," Chernysh said. The minister also noted that Sajdik's plan in fact proposes the legitimization of the formations "whose legitimacy has not been recognized by the authors of that document before." According to him, the so-called "LPR" ("Luhansk People's Republic") and "DPR" ("Donetsk People's Republic") are not de jure present in the Minsk process, and Sajdik's plan again brings these notions back. At the same time, Chernysh recalled that neither the Russian side nor the OSCE reacts to the proposals of Ukraine to make clear statements about the impossibility of full or partial recognition and legitimization of such entities within the Minsk process. "Who has prepared it and for whom, and why it has been published right now – personally I have got a lot of questions that we haven't yet found answers to," he said. What is more, the plan has not been handed over to the representatives of Ukraine through official channels, he added.